This beautiful canoe stern classic, launched in 2009 with steel hull and aluminium superstructure, was built by Benetti Sail Division to the highest of standards and with utmost cruising pleasure in mind. Her interior is also classic in style, finished in American cherry with fielded white panelling throughout while the saloon features wide teak planking underfoot. 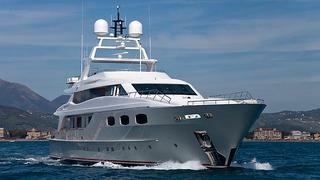 ‘This 27m Leopard has a unique interior and all silver painted exterior; she really is eye catching! 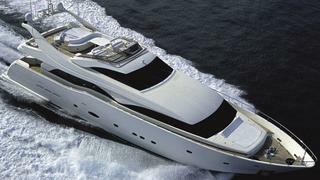 Easy to inspect and worth looking at in the Port of Nice,’ says Vassilis Fotilas of Fraser Yachts. Designed by Paolo Caliari and built in Italy by Arno in 2002, Zamboanga is more than just a looker – she has accommodation for six in three cabins, and a 30 knot cruising speed thanks to twin MTUs and Arneson surface drives. 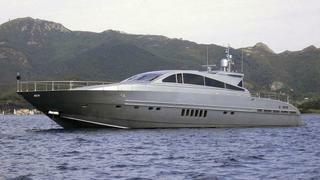 A barely-used, mint-condition yacht, Christine of London was built by Ferretti’s Custom Line using the most advanced construction techniques, and designed for extreme comfort with optimal use of interior space by Zuccon International Project. ‘Christine of London is simply the best value, best condition Custom Line 94 on the market, showing impeccably throughout, never chartered and with very low engine hours; her commissioning owner is very ready to do a deal!’ says Jim Acher at Ocean Independence. 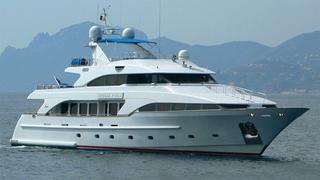 Built in 1998, this motor yacht is from the Benetti Classic 115 series with a François Zuretti interior and a 3,200 nautical mile range. ‘The impeccably maintained Benetti Classic Stella Fiera has undergone continuous upgrades over the last two years and is lying in San Remo ready to set sail with her new owner. We have recently received several offers which were turned down. The seller has become more realistic about the price and there is a deal to be had,’ says Tomaso Polli at Edmiston. Although she was built in 2009, this fast motor yacht is literally brand new and never been owned, so her interior is pristine, and those sparkling engines pack a punch with a top speed of 34 knots. 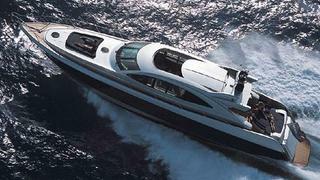 ‘This four stateroom Warren S87 is as good as new since it has never been sold to a private party. The MTU 10V2000 M93 engines only have 245 dealer demo hours on them and the manufacturer’s warranty has yet to be activated,’ says David Johnson at Denison Yacht Sales. Launched only this summer, this 43 metre Baglietto/Rossi Navi motor yacht has much going for it – Francesco Paszkowski styling, interior design by the Portuguese studio Aranhas & Vasconsuelos and bang up-to-date technology, equipment and facilities. ‘There are some amazing deals to be had in our sales fleet as we approach the end of the year but Why Worry is one that is attracting a lot of interest. This 43-metre displacement yacht is brand new, never before used, has exceptionally performance and is filled with the latest technology. 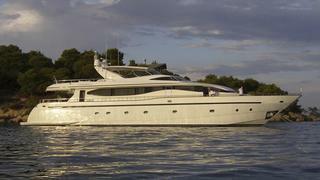 Sleeping up to 12 guests in 5 cabins, she is fully MCA and LY2 compliant and ready for chartering. She has an amazing interior layout and design, an owner who is very keen to sell before the end of the year and she’s on offer at a price that is both realistic and very attractive,’ says Mike Rich of YPI. A Versilcraft Planet 105 built in Italy, Katia is a yacht that engenders loyalty – she has had only one owner, a captain who has been with her since she was under construction and a crew of five that has kept her in perfect condition. ‘Katia is the definition of a lightly used, versatile family yacht which has been continuously maintained year after year by her only one owner and captain since construction. The standards for the interior as well as the mechanical part of the yacht have been always maintained to the highest degree. 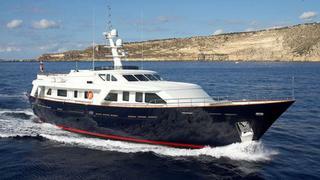 Moreover she is truly competitively priced and to top that her owner only three months ago paid VAT yet maintained same asking price,’ says her listing broker Michalis Papatheodoulou.